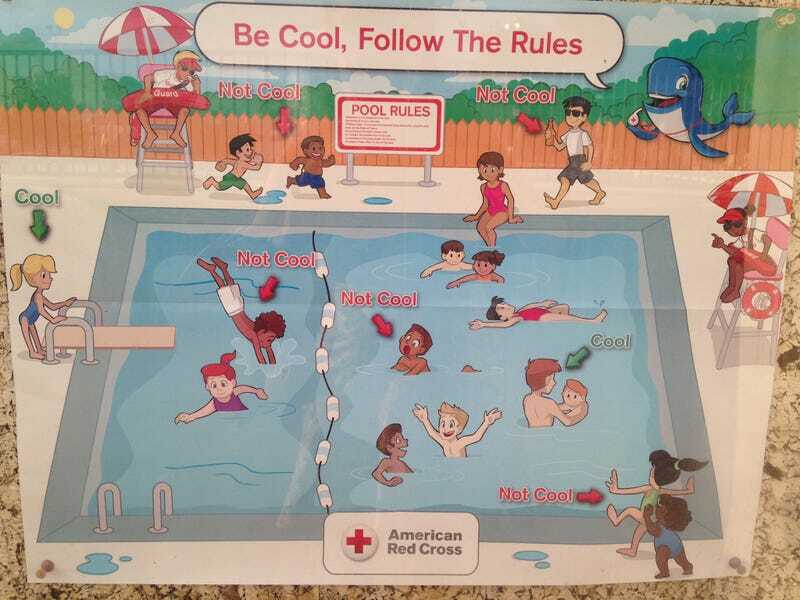 The American Red Cross is learning that a little revision goes a long way after a signboard about swim-safety guidelines came under fire for its "racist" message, prompting an apology from the Red Cross, NBC News reports. The backlash started after a photo of a pool-safety poster in Fort Morgan, Colo., started circulating on social media. The poster in question has since been taken down, but it showed how to play nice in the pool during the summer season, reading at the top "Be Cool, Follow the Rules." The issue? Of the multiple children shown playing in the pool, it seemed as if all the white children were labeled as being "cool" and complying with the rules, while all the children of color were "not cool," misbehaving and doing dangerous things. After the backlash, the American Red Cross confirmed that it had discontinued the production of the poster, NBC notes, and removed it from its website and Swim app. "The American Red Cross appreciates and is sensitive to the concerns raised regarding one of the water safety posters we produced," the organization told NBC in a statement. "We deeply apologize for any misunderstanding, as it was absolutely not our intent to offend anyone. As one of the nation's oldest and largest humanitarian organizations, we are committed to diversity and inclusion in all that we do, every day. "Going forward, we are developing more appropriate materials that are more representative of our workforce and the communities we serve," Red Cross added. "Our aquatic instructors have been notified of these concerns and we will advocate that our aquatic partner facilities remove the poster until revised materials are available." What do you think? Was the poster racist?